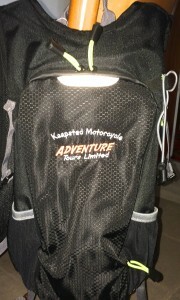 Below is a list of the kit that you must bring with you when you join us on one of our motorcycle tours. These items will not be provided for you. Your motorcycle’s luggage system will hold up to 62 litres in an internal soft case, but if you feel you would like a little more space then you may wish to carry a small rucksack. Please be aware that there can be wide variations in temperature, so make sure you pack an appropriate selection of clothing. If you’re bringing electronic devices, such as your phone and camera, please do remember to also bring their chargers/batteries (and spare memory cards/films) as there aren’t many places on the tours where these can be purchased. Also, if you own a hydration pack system, it is strongly advised that you bring it along. If you don’t have one, please get in touch with us as we have a supply of good quality backpacks with combined hydration bladder. These take 1.5 litres of water and have space for other small items. After many years of riding in all types of weather in Southern Africa we have come up with a jacket that is ideal for touring. Its waterproof inner with combined thermal liner is detachable. 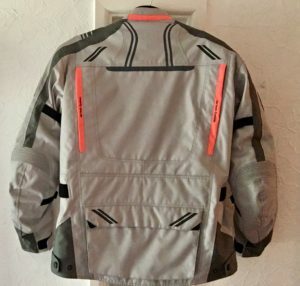 It also has numerous air vents on the front and the all important exhaust vents on the back of the jacket. Its light colour helps to reflect the sun on those hot days to help prevent over heating. 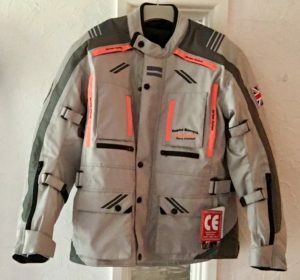 Sporting our logo on the front pocket as well as a Union Flag and Ride For Rhinos patch on the arms this jacket will cost you just £95.00 plus postage, which we can add to your final invoice. Small, Medium, Large and XLarge. Please allow up to 3 weeks for delivery.